Not every one is that enamored with working with tiny seed beads. But we have to admire those who do. 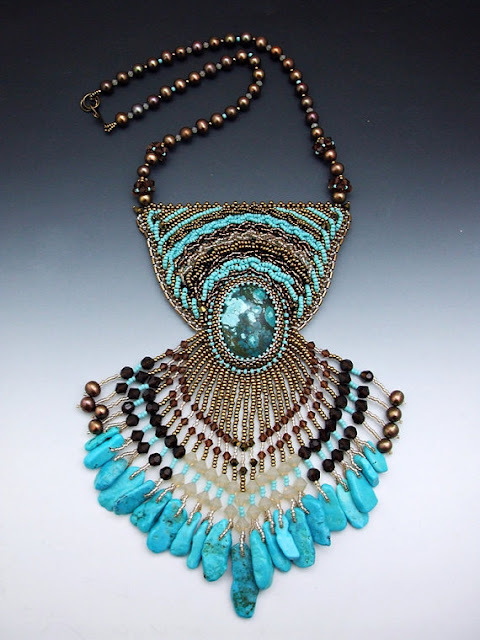 One outstanding artisan is Terri Richards who has an Etsy store called Terri Faye Jewelry. She created this lovely blue beaded bracelet so one lucky winner of this giveaway will get to wear it! Shown below are my favorites from her Etsy store including her sold section - a marvelous collection of not just gorgeous designs but beautifully photographed ones too. Terri's passion is to create beautiful and wearable works of art. She got her start early on. She said, "I believe art and creativity to be in my genetic make-up, given to me from my Mother’s love of Oil Painting and her other amazing talents, such as, glass etching, tile mosaics and fiber flowers, all the way back to my Great Grandmother’s beautiful handmade quilts and exquisite hand embroidery." Well, she does express her genes incredibly well. Her designs have made it to a number of competition finals such as those organized by Fire Mountain Gems as well as had some designs published! As you can see, she signs her work too! If you'd like to win Terri's light blue bracelet, then all you have to do is all you have to do is make a comment below. Extra entries if you become or are a blog subscriber or followeretc . If you also do shout outs, those will count as additional entries too! Please say so in the comments. This giveaway is limited to US and Canadian readers. It ends in a week's time at 6 pm EST Monday, April 16, 2012. I will pick a winner randomly and announce the results as soon as possible after. So be sure to leave a contact email if you don't have an online link or make sure you come back and check! Good luck! Amazing work :) I'm in awe!!!! Great work. It all looks very pretty. This is just lovely. Of course I would LOVE to win it! Gorgeous work! Thanks for introducing us to Terri. Wow, the bracelet is so beautiful. I would love to win it. The rest of your work is so far off the chart, the words outstandingly beautiful doesn't even come close. I posted the giveaway on my facebook page: http://facebook.com/catherinefranz. What a wonderful bracelet! Would love to win it! Thank you for the giveaway chance! Her work is amazing. Thanks for sharing. Her work is beautiful! I love the clasp in the light blue bracelet! 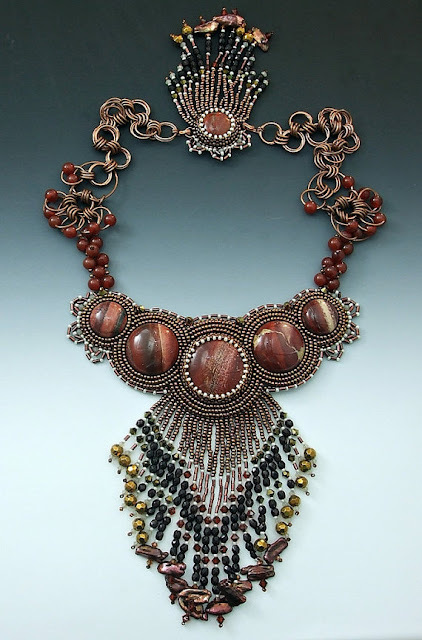 Love your delicate and luscious beadwork. Will remember your name. Love your delicate and luscious work. Will remember your name. Love your delicate and luscious work. So gorgeous, love the light colors! Would go with so many outfits! So gorgeous, would go with so many outfits! 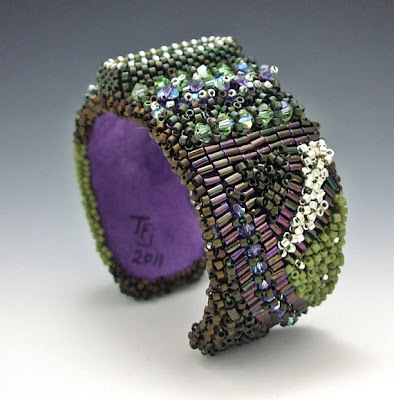 I happen to be a fan of Terri's work I think its just amazing!!! I happen to be a fan of terri's i think the work is great and the designs are amazing!!! Beautiful!!!! I only wish I could do such wonderful, intricate beating! I am a follower on facebook, twitter and newsletter. WOW!! I do some beaded work, but could never compete with her work. it is gorgeous!! her work is awesome!! I do some beadwork, but could never compete at your level!! 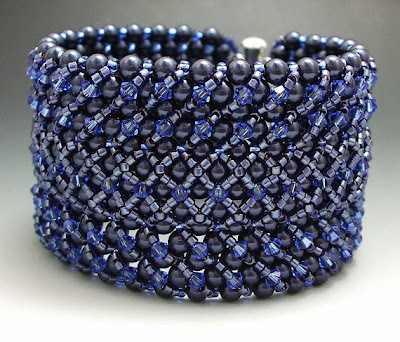 I do not understand why everyone wouldn't want to work with seedbeads! They are wonderful and soothing and basically awesome! LOVE beaded worK. I am a stalker on all the forums! Your jewelry is sooooo gorgeous. I would love, love, love to win the blue bracelet. It's my favorite color and it would inspire my own beadweaving. It's just beautiful. It's a beautiful bracelet - very nicely done. One of us will be very happy. Just wanted to say THANK YOU all for such wonderful comments! Wish all of you GOOD LUCK! This is awesome. I follow you on facebook, twitter, subscribe to your blog and I gave a shoutout on my facebook page.